1/16/2014 - Here's a Sparkmage Apprentice with some elemental gumption. Or something. Been distracted preparing for a game design convention this weekend. I won't be around, but I have prepared a Weekend Art Challenge for tomorrow. Wouldn't this be cause infinite EtB/LtB effects with two of them taking turns targeting each other? no... er unless you have a sac outlet. actually with a sac outlet this goes infinite with just one of these. Yeah, because you can sacrifice it with its trigger on the stack and return it. "Return any number of target creature cards…" fixes that (since the triggering card can't be targeted when it triggers). 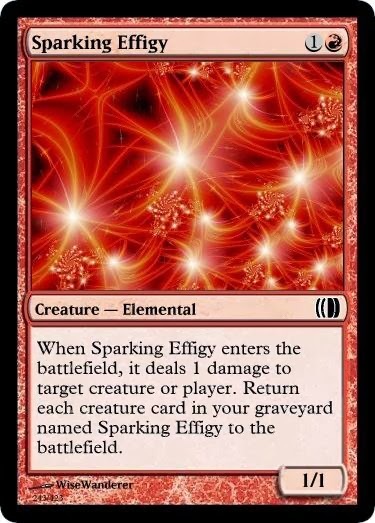 "When Sparking Effigy enters the battlefield, it deals 1 damage to target creature or player, and exile each creature card in your graveyard named Sparking Effigy. 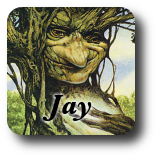 Return those cards from exile to the battlefield at the beginning of the next upkeep." Delayed fireworks? It's not as fun or as clean but it might reduce the infiniteness. Even with that fix, this is a 2-card, 3-mana infinite combo with Heartless Summoning.